I am interested in the women in our history whose stories are seldom told. They often disappear in the records when they marry and take their spouses' names.. If we are lucky, we find their birth/baptismal information but their mothers' maiden names are seldom given. Marriage records can be helpful but often are destroyed, missing or non-existent. Finding a matrilineal line is difficult. Then there is Grace Newell. Grace was married in 1860 to Eli Mercer. 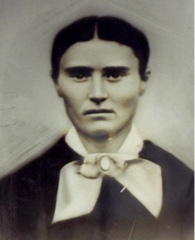 She is my husband's great great grandmother on his mother's paternal side. We have not been able to find Grace's birth date but we imagine it to be in the 1830s. The baptismal records for that time do not exist for that area. If she was born elsewhere in Newfoundland, finding her baptismal information will be a long search. We may never know the names of Grace's parents. We know that Grace married Eli Mercer in 1860 in Bareneed, Newfoundland. The name Bareneed itself conjures up interesting images. There are several theories as to the reason for such an unusual name, the most accepted of which relates to the bare land and exposure of the area on the Port de Grave peninsula in Conception Bay. We are fortunate to have a picture of Grace which is unusual for the time. Some of the earliest photographs in Newfoundland were taken in the late 1850s. The date of this photo is unknown. Of Grace herself, we only know what we can see from the photo or infer from her appearance. She has strong features, dark hair and eyes, with high cheek bones. Some people have suggested that Grace had Indigenous ancestry in her family line though the Newells in Newfoundland were originally from Britain. We would need to find her matrilineal line to confirm this suggestion. Her hair, though tidy, gives severity to her features. In the 1860s, a woman's long hair was parted and flattened to the head around the face and gathered in at the back of the head. By the 1870s, hair was gathered on top of the head so this picture may be from the 1860s. Could this picture have been taken before Grace married? After their marriage, Eli and Grace lived in Bay Roberts, Eli's home. Eli was a fisherman, according to an occupational directory of the time. 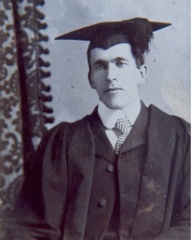 There they had five children, the youngest of whom was my husband's great grandfather, Richard Mercer. By the time Eli died in 1907, he was a planter. Eli and Grace's son, Richard, married Clarinda Moulton of Burgeo. Her father was a merchant. Richard met Clarinda when he was stationed in Burgeo as the Church of England minister. It was said that their wedding was the social occasion of the year. Clarinda and Richard had nine children, not all of whom lived to adulthood. One son survived, my husband's grandfather Richard, born 1909. One of his sisters, Faith was born in 1920. 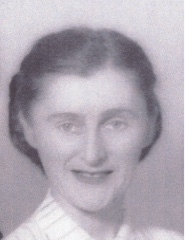 While her colouring is lighter than Grace's, the shape of her face is unique among her siblings and similar to her grandmother's strong cheek bones. Faith married late in life and did not have any children. We are remembering her today and giving her a place in the family story. *The photographer is JP Newell, who was born in Bareneed. We cannot help but wonder if he is a distant relative of my husband. His photo galleries, accessible on the upper left corner, are beautiful. **The first fishers of Newfoundland were migratory, sailing from Britain in the spring and returning again in the fall. The first resident fishers were called planters. Over time, the term referred to a man who owned a fishing vessel. I think Richard Sr. has some of Grace's features.A story that makes us think of the women in our gene pool. So, you are a bit of a genealogist? I've tried a bit, but I'm not very good at it. It's so important to document these family stories, so that they are available to the generations that follow.... whether they are interested or not. I've done a lot of family history investigations. Everything I've found is written down, and has been given to my sons. They are sort of interested, but more concerned with jobs, children, daily living right now. At least it's there for when they have time! He had the dark eyes and eyebrows. The women's stories are important for our children to know too. Everyone starts somewhere. You learn as you go. Patience is well used too. Every year new records are available on-line. It is rewarding though when you get into it. If they aren't interested now, there will come a time when someone will be interested, sometimes long after we are gone. Having the record will be such a treasure to the generations to come. He was a musical treasure. Glad you mentioned him! I love to read peoples family history. I bet Grace Newall was a very strong minded lady, she certainly looks it. I agree. She looks determined, doesn't she. What apps/sites do you use. I can use ancestry.ca at the library. I resist coughing up the $ to sign up at home. But I do get a bit lost meandering around that site. If you Google gen web Canada, the various provincial sites show up and you can use whatever ones you need. I joined Ancestry when I needed to find connections in the U.S. You can get two weeks free to give you an idea if there is anything worthwhile there. I paid for six months or so and it was productive. Most provincial sites have places where you can ask the readers for leads or information they may have a out someone you are researching. I got a lot of info from a distant cousin I found that way. Write down what you know and ask relatives what they know. You'd be surprised the wonderful info you can,get that way. I love the stories as much as the factual info. The stories make the people real. Be sure to check census info as well as occupational indexes and old newspapers. This stuff is available on-line for NL so it should be for the other provinces as well. If you know the history of an area, you might get an idea about what your ancestors were doing at a certain point in time. You can get leads for your research from the history too. Good luck. It's an interesting journey and one that helps you understand where you came from. No matter what you find, the fact that you exist means your ancestors did something right. Enjoy! If you Google family search and the province you are interested in, you will get a wealth of information as well. She really was. Wish we knew more. Hello Marie, I suspect that I might be able to help you RE Grace Newell from Bareneed. I'm trying to trace my family tree. I can trace it back to my GGF Ebenezer Newell from Newfoundland. It gets cloudy from there. 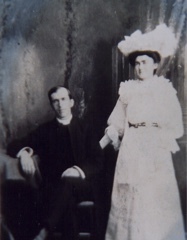 His wife, Mary Ann Moorse were married in Glace Bay, NS. From what I can understand, Clarks Beach was where he was from. Does anyone have any knowledge of Ebenezer?